The Tough1® 1200D Water Repellent Horse Sheet offers great protection for that sudden rain shower at the show, camping, trail riding, or everyday pasture use. Made of strong, durable 1200 Denier water-repellent nylon with a 210 Denier lining that washes well, it features shoulder gussets for excellent movement and increased shoulder fit. A versatile all-around wind and/or light rain sheet, it's a terrific value. Please note: This sheet is water-repellent. It is NOT waterproof. I like the sheet in purple however, it is big. My horse measured 74" so I bought a 75" thinking it would be alright but, I should have bought a 72". I would recommend this product but, they run big. Love them! 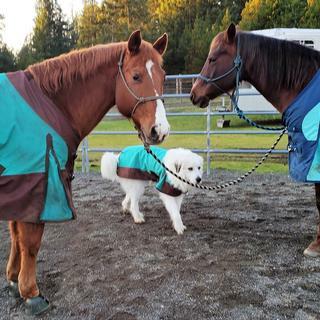 All 4 horses & my dog are wearing them now. Real easy to put on & take off. Just hosed them off & they came clean. Great product. The fit was perfect and it’s keeping him dry ! They fit my horses good. The horses seem to be comfortable in them. Thank you. PS. When should I be receiving the one that was black ordered. Love this blanket. Great coverage on the horses neck. Kept my horse dry in the rain. Not durable for young rough horseplay. I love the colors! I also have a royal blue one. It’s not as indestructible as I would like. It’s been ripped by another horse already! ?? This is a very good product. High quality, durable and excellent fit. Comfortable for my horse with no rub areas! I am a fan and will continue to “dress” my horse for the weather in this! Hardware (front snaps) could be a bit more rugged, otherwise an excellent well fitting blanket. For some reason the jacket is soaking through. It doesnt appear to be waterproof. I am not happy with the jacket. It is the first waterproof horse blanket that I have purchased that I will need to waterproof myself. I purchased this as a rain sheet as it says it is breathable and waterproof. It is neither. My horse was soaking wet when it rained and it was soaking wet when it was dry. He was cold and wet in the morning after no rain. He would have been better off with no sheet at all. I recommend a Weatherbetta or a Rider International. I have both and they are excellent. I guess you get what you pay for. Buying another Weatherbetta now. Great price and fits my wife’s horse perfectly. My horse was wet after first wear and it was just a light rain. I will now spray it with a water proofed so hopefully he stays dry. Put together well though. I bought two of these in January & used them for first time last night. We had a hard cold rain & this morning I found my horses soaked and cold under the sheet. They would have been better off without!! I have three horses & my third horse had a different brand and he was dry. So upset!!! I do everything I can to keep my horses healthy and to have this happen is so frustrating! I have purchased two of these sheets now. I love them. Fit well and great durability. A must for California cool nights. My boy has stood out in down pours in this sheet and has stayed nice and dry! Love Tough 1 blankets and sheets! I am very pleased with this sheet, great to transition from winter to spring temperatures! Fit and sizing are very accurate. Beautiful colors, great fit. NOT WATER PROOF. I like the front neck/shoulder and higher-neck fit on these. It works well on one of my hard-to-fit horses. Great blanket for the price. I have the 600 Denier one and it doesn't do that great of a job with durability and doesn't hold up to water/weather well. This ones does a much better job in the 1200 version, but still doesn't stand up as well as my Weatherbeeta blankets. I did find that this sheet worked well with liners that I already owned. Recommend if on a budget and your horse is easy on clothing! I love the features that this blanket has. It is my favorite one. I love the hook closure instead of buckles. A lot easier to fasten. It fits great and keeps my horse nice and dry. It is perfect for the Pacific Northwest weather. I can also clean it easily. This is waterproof but since it is not breathable horses sweat under it then freeze because they are soaked, DOES NOT BREATH. Exactly what I was looking for in a rain sheet for my horses! Good price, excellent fit! True size! Thanks so much Tough 1 for keeping my horses warm and dry! Would definitely recommend and purchase again! This blanket is advertised as waterproof but it's not. One afternoon of rain and it started leaking. I'm very upset about it. It's useless to me. I bought another sheet from another brand and it keeps my horse dry. Not this one. And, of course, since I used it, I cannot return it. So my only option is to get a can of waterproof spray and spray the blanket with it, not really the point of getting a waterproof sheet if you have to waterproof it yourself. Connected though1 to let them know. They didn't answer. Save yourself some $$$$ get another brand. Or get a waterproof spray can and spray the sheet before using it. Good service, good product, but slow on delivery. With slow delivery it was OK for this product as I was in no hurry as this was aback up blanket. I bought two of these blankets. They were great with the rough and rowdy horses, but in steady rainfall not waterproof. They fit a little larger on my mare. I like the coverage though. The neck keeps folding in, maybe because it's a little bigger than sized. Good for light rain, but not heavy and continuous rain. I have purchased Tough-1 blankets in the past. They hold up well, and kept my horses warm and dry. I chose this blanket because it looked well made. I am very satisfied with this blanket and the quality of the material, hardware and fit. Is this blanket thick enough for very old and wet winters in Colorado? This blanket is more like a windproof and waterproof cover. There is no insulation in this blanket. If your horse has a lot of fur it may be ideal. If your horse has no fur he would most likely be very cold. This item is a sheet and not a blanket. Please read the descriptions as there is a blanket in this style but with a thicker and warmer lining. From your question you want the warmer style. This is more of a stable sheet, if you have cold winter you want a medium or heavy weight and this doesn't fit the bill. I use this for rain and wind when it's in the 40s. No. I bought 2 of these sheets for my horses. There's no poly fill for warmth. It will keep them dry, as far as warm, I'd recommend the Tough One Heavy weight blanket! It depends what you consider very cold but it will definitely keep your horse dry and provides a good barrier against the elements. No, it is not. This is only a sheet and has no insulation. No its a rain sheet not blanket. Is this actually waterproof. I have bought so many rain sheets and after a good rain I discover my horse is wet underneath and with cold temps then they are cold? BEST ANSWER: I have heard the same comment from others but didnâ€™t experience any leaking myself. However I have made it a â€œnormâ€ to thoroughly soak my new blankets with a high quality, sports waterproofing spray - using approx. 2 full cans per blanket or sheet and letting it dry completely before using. I felt the superior features and construction of the Tough-1 products were well worth the extra step / expense. Thanks good idea with the spray even though you would thing bring waterproof it would already have a coating but it seems unless you have a coat with a poly lining they will get that condensation or leak. Thanks for the tip.! This is the best blanket we have bought. Rained all day yesturday and very cold 34 degrees and our horses were dry. These blankets are very durable too. WiLL buy them again. 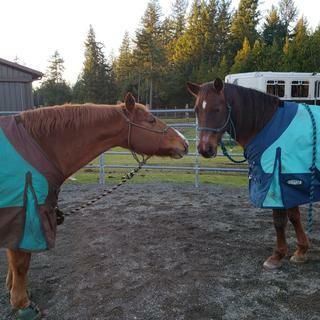 My gelding stayed dry through a big storm last season but i added kiwi outdoor spray waterproofing to all of my blankets. I liked this sheet better than others in the past. I love the tough one filled ...but to be honest the rain sheet was the worst Iâ€™ve ever had. My horse was soaked. SStack storm shield is hands down the best Iâ€™ve purchased. Yea mine too i just thought i got a bad one or it wasnâ€™t really waterproof like I thought. I will try that spray and maybe a lining under which is kinda of a pain since Iâ€™m only using it for the sleet as my horses have a big thick coat so I like that itâ€™s light and they can still fluff their own coat for insulation but i want them dry. Yes, Its waterproof. However, given your concerns, I would suggest our 1680D Super Tough Waterproof sheet. It gets the job done. I have found all of mine to be truly waterproof and horses dry underneath. You are lucky i think at least some of the times they were wet was condensation. I had to buy a new one as my horse got skunked and the smell is horrific. Does this sheet (Tough-1 1200D Waterproof Sheet) have snap/ring closures at the chest, or only buckle/strap? BEST ANSWER: This sheet has buckels /straps and loops for holding the straps ends. Are the leg straps removable? BEST ANSWER: Yes the leg straps are removable. I am buying this as a gift , how do i determine the size ?